These Howler Monkeys in Costa Rica make the coolest sounds when they talk. They do indeed howl! We love monkeys and Costa Rica is a great place to go on a monkey safari! This shot is of the famous Howler monkey known for its loud howling voice. Their calls can be heard from miles away and are in fact used as a defense mechanism to scare of threats and predators in addition to talking to their own kind. If you imitate a Howler monkeys calls, they will talk right back to you! Join our travel club on the next Costa Rica safari adventure in 2013! Great photo – what a lot of personality it has! haha yes! You should hear them too! haha really? Is it on your travel blog? Now that’s a distinct face – great shot! Thanks Samuel! Monkeys are so cool haha..
Ummm…. it looks like it could be low hanging fruit… perhaps? 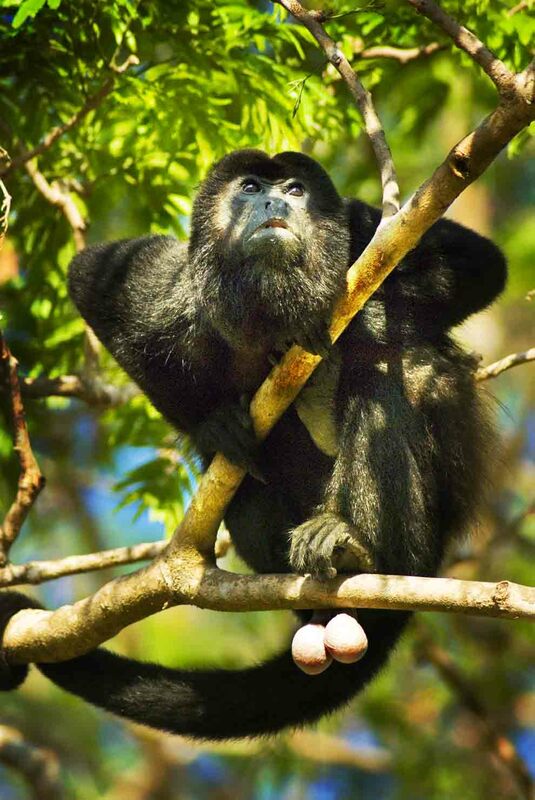 Ha–well if you see low hanging fruit like that below a Howler monkey I dare you to pick it! Great shot! I’m going to try howling back the next time I hear one roar in my travels. haha do it! It’s like talking to monkeys, except not.